Periodically one may spot a type of winter skier whose technique stands out as being rather different – gliding down the powdery mountain slopes, intermittently dropping to their knees, sinking into a low crouch through each turn as they submerge into the deep snow before energetically rising up again. You may have wondered what kind of skiing is this? As it turns out this is an older style of skiing that pre-dates the modern ski-lift. Curiously it is called Telemarking and began in the mid 1800’s in the northern Scandinavian country of Norway. Long winters provided an abundance of powdery snow but to access it one first had to find a way to the top. Climbing the hills was the first step to conquer before descending down the mountain’s slopes without any brakes on simple planks attached to their feet. Skis used at that time were long – over 2 meters – and could best be described as straight wooden planks without the metal edges found on modern skis. Crude leather shoes were attached to the planks by a string made of natural fibers. Picture a string looped over the toes to enable the heel of the foot to move freely up and down and was the way a skier could more easily ascend up a mountain and eventually ski its sloped terrain. Sondre Norhaim “the father of telemark skiing” from the district of Telemark in Norway introduced the telemark turn and drove its promotion both domestically and later on around the world. He discovered the first ever turn on skis best described as lifting the heel of one leg followed by turning in a wide span up the hill. At first the knowledge of how to link each turn proved evasive but the development of shorter skis provided the solution. 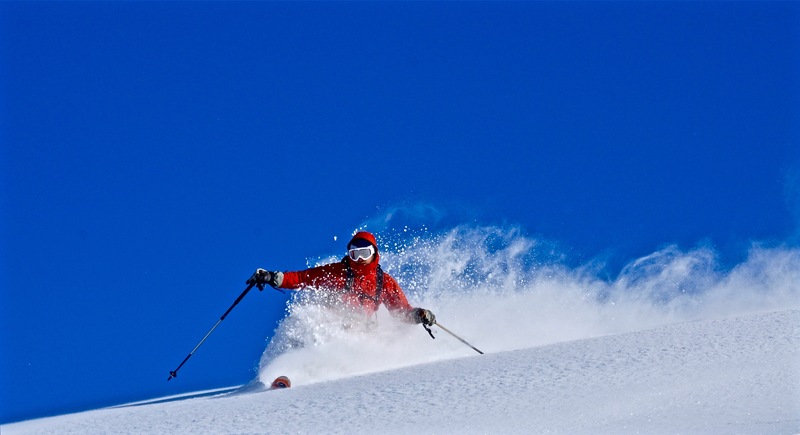 Although Telemark has never gained the runaway popularity of alpine skiing or snowboarding it continues as an important variation of the sport of skiing. By the 1920’s the sport began to popularize in the USA. The skis were long and skinny and the boots started to become more rigid but still made of leather. The biggest leap forward was the design of new metal bindings called “the three pins”. This advanced gear allowed skiers to explore the backcountry and its highly sought-after powder snow. It was also a great escape from the evermore crowded ski resorts. The 1990’s saw the arrival of plastic boots to the market which impacted the sport and changed it in positive ways. Plastic boots provided both more control and support during a skier’s turns which meant skiing became easier for beginners to learn. This technical revolution extended to bindings and skis. The result has been a rise in the popularity of Telemark skiing. Recently the sport of Telemarking has entered a new phase in its evolution. New bindings are improving foot stability which allows the foot to release if a skier falls. Prior versions of bindings had springs attached to the heel of the boots so that even when a skier falls it would remain attached. By eliminating much of the risk in falling the dangers of injury from telemarking have been significantly reduced. New advanced step-in bindings also help to improve a skiers telemarking technique enabling telemarkers to enjoy the winter mountain terrain in a much safer way. In order to facilitate the lifting of the heel Telemark skiers need to use special bindings and boots which allows the heel to be lifted into the air. Special boots are designed with the ability to flex in the front toe area allowing the foot to move forward while simultaneously releasing the heel. The binding acts as a spring and transfers power to the skis for controlled turns. The two ypes of bindings used for Telemarking are cables and NTN and each type requires compatible boots to function. Cables are a traditional system which is still widely by telemark purists as they are light, durable and easy to maintain. Cable Boots clip into a tongue in the binding and are then attached to cable springs on the skier’s heel. When choosing Cable Boots be aware that 75mm is the normal type. NTN boots work as a step in system allowing a skier to open the binding and then gently step into it. Next the binding clips to the boots at its sole and attaches at the toe area. Most rental shops carry the traditional cable system because some telemarkers prefer its softer and more responsive feel. Miha Grilj chooses the NTN boot and binding system as it enables him to ski more aggressively and follow skiers in front of you on backcountry terrain more easily. For beginners Miha Grilj recommends solid all-mountain skis with cable bindings and the 75mm norm boots. 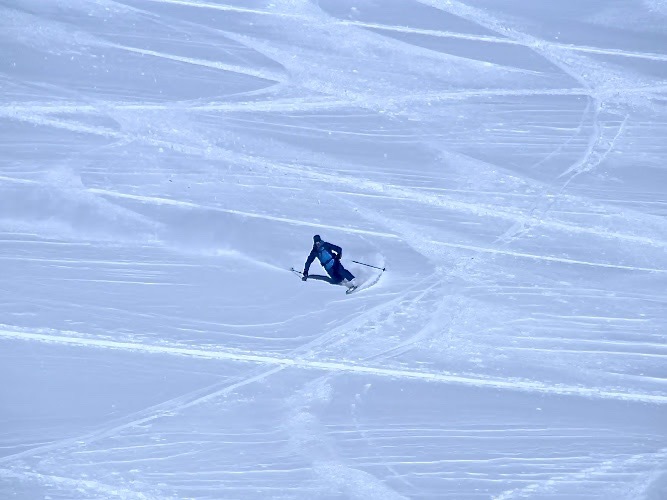 Perhaps the most important element of telemarking is the skier’s stance as this is what truly distinguishes telemark skiing from alpine skiing. The difference between stances stems from the differences in the binding systems of alpine skiing and telemarking. Telemarking utilizes boots with a flexible toe and bindings that detatch and allow the skier to lift up the heel when turning. As a direct result of this, the telemark skier has more free movement in comparison to an alpine skier. This “freedom” is the prime attraction for choosing to telemark. For purists of the sport it gives the skier a more lively feel for the mountain’s terrain. In the video above, note how the front ski is pushed forward while simultaneously the heel of the trailing foot is lifted up. The telemark skier spreads their skis while maintaining adequate space between their feet. As the skier sinks into the telemark position both skis are slowly rotated in the direction of the turn. After every turn the skier raises up the body again and smoothly transfers body weight from one leg to the other before shifting the skis and sinking back into the next turn. Think of it as dancing on the snow and as Miha Grilj describes it – “lift up the heel and the mind will follow”. Miha’s experiences in teaching telemark skiing tell him that some students pick the up proper techniques really quickly while others are quick to give up. It is a little more difficult on turns in the beginning since it requires a different type of movement than alpine skiing or snowboarding. It is definitely for those who are fit and have reasonably good coordination. Miha suggests the transition to telemark skiing is much easier for snowboarders which sounds strange however the stances have some common traits. Skiers on the other hand take longer to learn because on the first lesson they are forced to separate their legs – the freedom that telemark equipment gives them stokes stability fears. In general, it takes few days to smoothly link the ski turns and it definitely helps if the students are already familiar with how to slide on the snow with skis. Complete beginners would talk a bit longer but no longer than for snowboarding or alpine skiing. Compared to alpine skiing or snowboarding, telemarking is more physically demanding and requires better coordination. 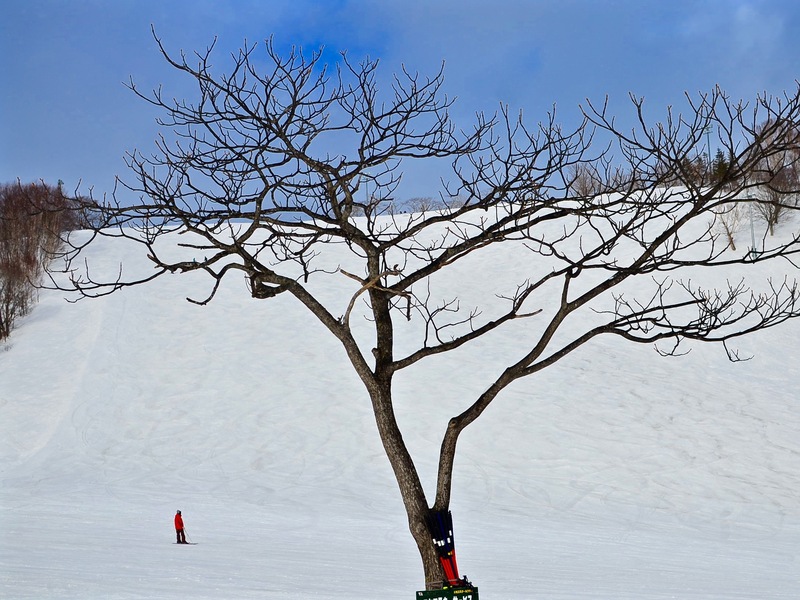 In Niseko beginners should choose a gentle terrain like the Holiday slope in Hirafu. For more experienced Niseko telemark skiers a good choice is a Green run chosen from the top of the gondola lift. Beginners with more questions are advised to contact a telemark instructor like Miha Grilj at GONDOLA SNOW SPORTS SCHOOL and allow them to provide more detailed guidance. Telemark expert Miha Grilj is a passionate skier helping to raise the profile of the sport in Niseko. Born in Slovenia, a tiny country located between the Adriatic Sea and the Alps, Miha started skiing at the age of four and has never missed a winter season since. He is now heavily involved in the sport of telemarking both as a fully-certified instructor and as head coach of the Slovenia Telemark Demo Team for the past 4 years. He also acts as an international telemark promoter for the ski association of Slovenian instructors. Miha Grilj is both a professional snow sports instructor and ISIA certified telemark trainer. His love for the telemark brought him to Japan where he first worked for a ski school as Snow Sports manager to assist in the promotion of Niseko Telemark Skiing. 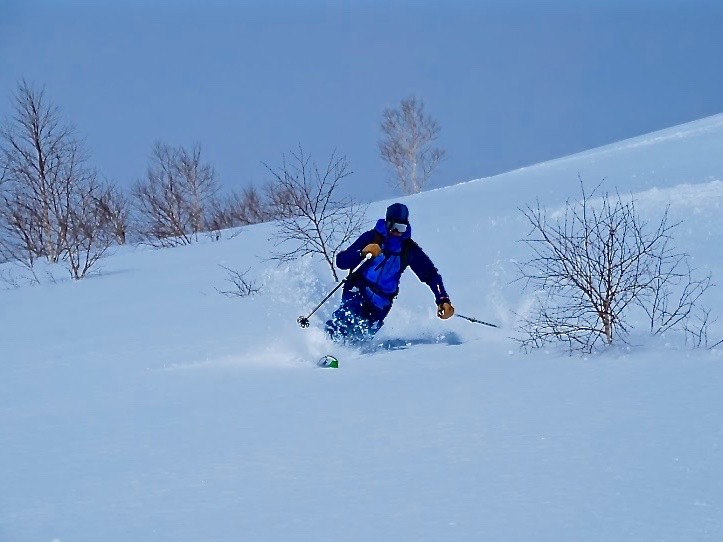 A partnership with the Norwegian ski clothing maker Bergans of Norway affords Miha the opportunity to assist in developing telemark skiing in Hokkaido and throughout Japan. Working within the burgeoning ski community he believes the sport of telemark skiing has a bright future in the powder haven.